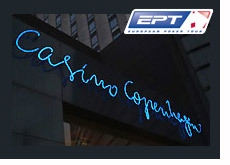 39 players remain in the EPT Copenhagen Event, also known as the Scandinavian Open. Rasmus Hede Nielsen is your current chipleader with a stack of just over 295,000. Joris Jaspers currently sits in second place with a stack of just under 295k. The money bubble has now burst in the event, and all remaining players are guaranteed a payday of at least $12,500. The remaining players all surely have their sights set on a loftier goal, and that is the $1.236 million dollar first place prize and EPT crown. There were a number of notable eliminations on Thursday, including Bill Chen and Michael "TIMEX" McDonald. This tournament has had another very strong year, reaching its cap once again (460 players) after increasing both the cap and the size of the buy-in. This tournament is extremely popular because of the fact that Pokerstars.net sponsors the tournament and runs many satellites, and due to the fact that poker continues to boom in Europe, particularly Scandinavia. It also doesn't hurt that you only have to be 18 years of age to play in this tournament. Many young poker players find themselves unable to play in many US tournaments due to their age. Play will resume at 2 pm local time on Friday, when the remaining 39 players will play down to a final table, which will take place on Saturday.